In July 2016, the Canadian Armed Forces (CAF) awarded a CAD $1 Million contract to Halifax-based company Spring Loaded Technology to deliver 190 bionic knee braces to the CAF. The UpShot Tactical Knee Brace is the military version of the company’s brace, which allows soldiers to carry more weight while travelling longer distances. President of Spring Loaded Technology, Chris Cowper-Smith, describes the brace as using liquid spring technology which absorbs shock and reduces the impact on knees, allowing soldiers to go from wearing a 90-pound pack to wearing a 130-pound pack. The UpShot is priced at $5,100 (CAD) and features reinforced carbon fiber arms to protect the knee from high impact. Levitation, is the company’s consumer knee brace, which features the same technology, but is primarily used for injury prevention and rehabilitation. The brace will first be worn by soldiers at army headquarters, being used for day-to-day activities as well as workouts. After initial feedback is submitted, the braces will endure higher intensity testing in the field. The United States Army has also been pursuing similar technologies. United States Special Operations Command (SOCOM) has developed an exoskeleton suit called Tactical Assault Light Operator Suit (TALOS), which bears resemblance to the ‘Iron Man’ suit worn by comic book superhero Tony Stark. The TALOS is expected to be bulletproof, weaponized, and have the ability to give the user super human strength while monitoring vitals. One of the TALOS’ key features is the liquid armor, which solidifies when it comes into contact with a bullet. Norman Wagner, a chemical engineering professor at University of Delaware is developing nanotechnology for the suits’ body armor. “It transitions when you hit it hard,” Wagner said to the National Public Radio (NPR). “These particles organize themselves quickly, locally in a way that can’t flow anymore and they become like a solid.” The increased protection and capabilities of the suit makes it ideal for soldiers on the front lines. Together, the CAF’s purchase of UpShots as well as SOCOM’s interest in further developing exoskeleton suits, points towards a larger trend of wearable and fully autonomous military robotics within the future of war. However, not everyone applauds this development. Stephen Hawking and Elon Musk have both stressed the potential dangers of the emergence of autonomous killing machines. Both Hawking and Musk are involved with a group of scientists, researchers and academics who recently released an open letter highlighting the inevitability of an artificial intelligence arms race. The letter describes autonomous weapons as “the third revolution in warfare, after gunpowder and nuclear arms.” Although TALOS must be operated by a human, the suits are seen by many to be a precursor for a fully autonomous robotic soldier. 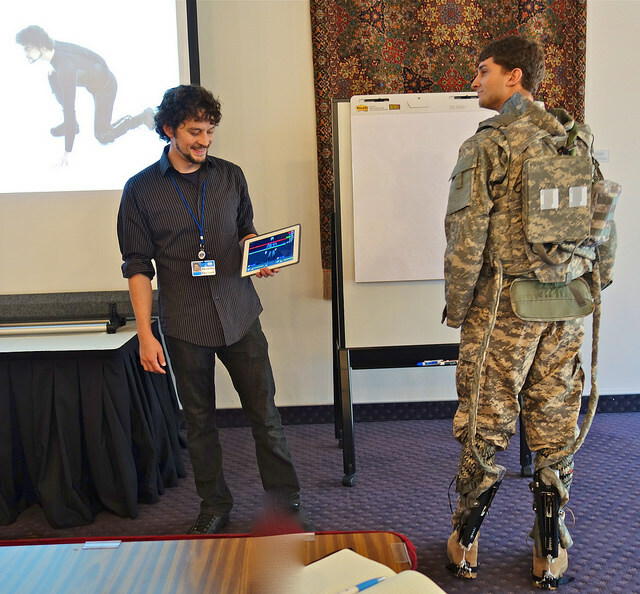 Photo: a US Army bionic prototype similar to the Upshot showcased at a Cyborg conference (2014), by Steve Jurvetson via Flickr. Licensed under CC BY 2.0.